Actress Claire Jared and Cat’s Whiskers director Carol Allen are both actively involved in the Women in Arts Festival at the Actors Centre next week (16th to 18th December). They may both be a touch bleary eyed though as the previous evening (Monday 16th) Claire will be playing the part of Marilyn Monroe in David Bottomley’s play “The Peacock and the Nightingale”. Carol will of course be in the audience as this sounds like it’s going to be fascinating stuff for anyone interested in theatre, film or literature, as the story is based on the meeting between veteran English poet, Dame Edith Sitwell (played by Jean Apps) and Marilyn Monroe in 1950’s Hollywood. Further details can be found on the Women in Arts website: http://soandsoevents.wix.com/women-in-arts#!monday-dec-6th/cqhb There are also lots more interesting performances, rehearsed readings and other events over the three days, all focussing on Women in the Arts. 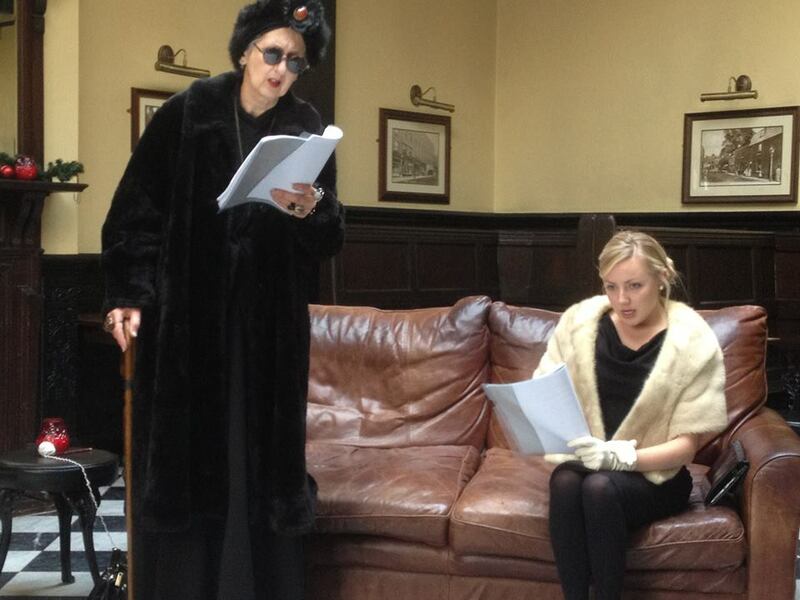 Here are Jean and Claire rehearsing the play. Hello, I think your website might be having browser compatibility issues. When I look at your blog in Ie, it looks fine but when opening in Internet Explorer, it has some overlapping. I just wanted to give you a quick heads up! Other then that, very good blog! Glad to be the reason for you getting a good lunch!